the end of summer. 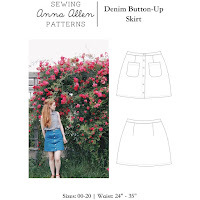 | Anna Allen Clothing Blog: the end of summer. Well, I'm back! I know it has been awhile, hasn't it? I've been through a whirlwind in the last few weeks. Went to California for my brother's wedding (more on that later) and then got back and had all four wisdom teeth removed and finally, finally I am starting to feel a little better! My left side still bothers me, so I'm still taking lots of pain medication, but I think it's starting to lighten up a bit. In the meantime, I've been spending a lot of time in bed and on the internet. In the next few weeks, I'll be packing up all of our belongings and then off Jed and I will go to Chicago! I'll elaborate more on that later as well. I'd like to start blogging on a more regular bases once we move and get settled in our new home. I would really love to start blogging more about our apartment and decorating as well. I've got a lot of ideas! I would also like to get better at my photography. Jed has a really nice camera and I'm determined to learn how to use it! In shop news, I probably won't have a fall/winter collection up until after everyone else. I've got so much on my plate right now, I'm just going to focus on one thing at a time! After I'm settled in a little bit at our new apartment, I'll re-open the shop. I know some of you have contacted me about the seaside dress and a few other items and they will still be available. I'm thinking of making a wool coat for the winter collection, but I'm still unsure if I really want to tackle such a big project. But I recently came across some gorgeous wool and I really want to use it somehow! I'd also like to make some silk tops. And maybe some plaid tunics or shirts. We shall see! I'm also considering not making historical clothing anymore. But I haven't decided yet. It's just that it takes so much of my time and I'm frankly burnt out with all the custom orders. Each custom order takes so long, sometimes months. And it's mentally draining and stressful. I'd like to be focusing more of my time on my own designs and collections. SO anyway...that's what I've been thinking about lately! I've also been thinking about fall fashion! What keeps entering my mind right now is jeans and pants. What do you think about the bell bottom trend that keeps popping up? I'm itching to get my hands on a good 1970s jeans pattern and make myself a pair. I'm also continuing to search for the perfect pair of pants. I'm thinking since my budget right now is so tight, maybe I'll just make my own pair. I've been looking at patterns from the late 1960s and early '70s. I like the pants that are straight and ankle length, slightly more slim but not "skinny." Perhaps made of wool or just a plain cotton twill. You know, the kind that hits a little higher than the hips, but not too high. I'm also thinking of a pretty drapey silk blouse with a simple collar and v-neckline. 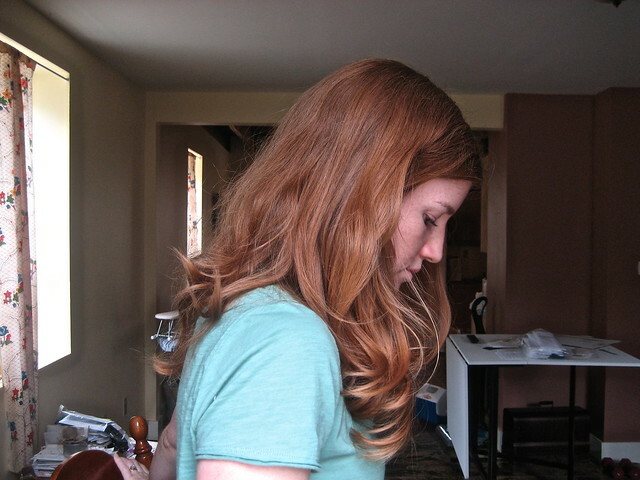 The length would be lower in the back than the front and pretty loose. And of course I am always a big fan of a good plaid shirt for fall season. Oh and anything equestrian! Riding pants, riding boots etc. I'd really like a good pair of riding pants and of course my dream pair of riding boots are always on my wish list! And as far as shoes, I did a little online shopping while I was on heavy pain medication (heehee) and bought these LL Bean Suede Blucher Mocs after thinking about it for awhile. Yep, I'm copying the fashionable Joanna from Cup of Jo! I can't wait to wear them this fall! And now to talk about the pictures of my hair! Have you seen this? It's this ingenious way to curl your hair overnight with no heat and only a bit of water! I have really thick hair that is prone to frizzies, so I did this a few days after I washed my hair. I also use argan oil before putting my hair up and then also after taking my hair down to smooth out any frizz. Love that stuff! You should really try it! I felt like a 1970s Nancy Drew when I woke up this morning! I love my bouncy hair and I especially love that I didn't have to spend any time with a hot iron! Best of luck on your move to Chicago. I loved living there for the 2.5 years I was there. I did a few blog posts on my favorite things in the city here: http://mscleaver.com/2008/08/18/things-ill-miss-about-chicago/ and here: http://mscleaver.com/2010/10/25/chicago-my-favorite-places/. What a good catchup. So sorry about your teeth! I am all for more AA designs, especially a coat as I am still nursing my wounds from not getting the one you recently sold. I am not anti flare but I really hate how they are all so stinkin' long. And I'm tall! I feel like you're supposed to wear high heels with them and I don't do heels... Can't wait to see what you make! Good luck on your move, we're all rooting for you. Oh Anna yoy have just the hair I have alwaya wanted to have...so pretty and it seems to me so natural... Others like me have to do a lot to my hair to make it just look half as good as yours.... And congrats on your wedding... ! Heather, thank you for the encouragement!! all these changes happenin', but it's good! and after finding two ticks in my bed (we get them here in this old house on a regular bases crawling up the walls etc) i'm so ready to move! sorry about that coat! perhaps i'm getting ahead of myself, but i think adding a coat to my collection would be pretty cool. in any case, i plan to make myself a new coat and you never know when i might tire of it! ;) i generally don't like flare jeans, but the more retro '70s bell bottoms intrigue me. also i never thought about it, but you are right about heels and bell bottoms! i hadn't thought of that. i wonder if my clogs would work... you won't see me wearing heels on a regular bases that's for sure! mette, thank you! i'm always wrestling with my hair. it's so thick and hard to deal with. but i am starting to learn how to work with it. i don't really like to spend a lot of time with hot straight irons and such, so it's nice when i can find something that requires little work and no damage to my hair! 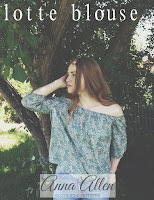 Hi Anna, I just came accross your blog and thought I'd mention how much I like the very first photo of you. It's awesome. I'm not sure why I like it so much though. I guess it's the portrait artist in me that is drawn to it. Hello, it's my first time here and I'm loving the blog! Let me just say that your hair is gorgeous. Beautiful color! The vintage style curls (without heat) is a wonderful trick, thanks for sharing! Such fun links. Thanks for the inspiration. Can't wait to follow your adventure in Chicago. Best of luck! 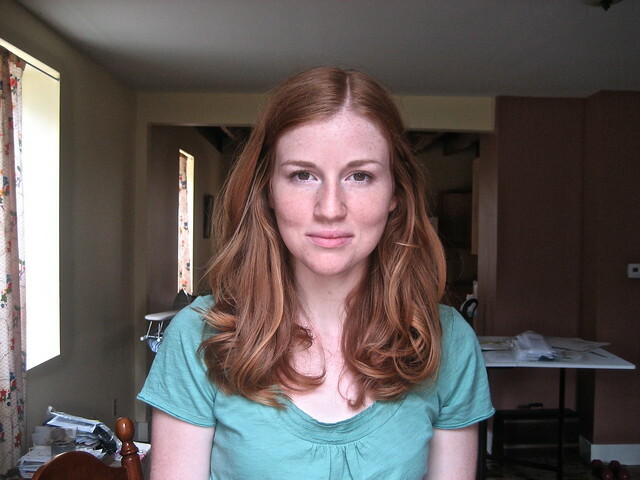 Just wanted to say thanks for posting about your hair - I've done it twice since reading this and love it! Anna, I wanted to tell you that my best friend from High School lives in Evanston, Chicago. She knows all the best thrifting, dining, and hangout places in the area. She's going to the art school there. Let me know if you want me to put you in touch with her, I'm sure that she'd love to meet a new friend. ;) Hope your move goes really well! I'm sure that you'll love Chicago, it seems like a really neat city. your hair is so lovely and as an iowa citian i am curious about where you go to get it cut? do you mind sharing? I just stumbled on your blog today and have only read this first post, but I am sure your blog will be on my daily reads now! How gorgeous you are! That hair is so beautiful. I'm definitely going to check out that tutorial. I've always been awful at curling my own hair. Also, I'm familiar with your designs, and love them. Glad to hear that you're focusing more on that. Can't wait to hear more about your adventures!